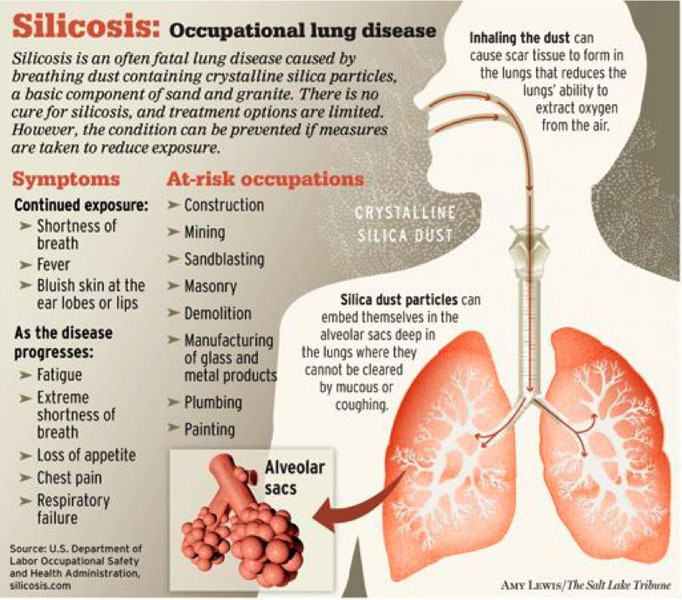 Silicosis is an incurable, irreversible, lung disease caused by inhaling dust containing free crystalline silica, often found in mining operations, quarries, and some factories. Free crystalline silica is one of the most common minerals in the Earth’s crust. Silica dust is frequently invisible to the naked eye, so light it can remain airborne for a long time, and can travel in the air or on surfaces for long distances, potentially affecting otherwise safe populations. Inhaled silica particles damage lung tissue which inhibits normal breathing. In some cases, exposure to silica dust can lead to tuberculosis. The World Health Organization (WHO) has studied and launched programs to increase awareness and preventative measures, as well as deal with the consequences of silicosis, yet incidents continue to be reported in developed and developing nations at an alarming rate. Mining in South Africa - A significant case of widespread silicosis occurred in the mines of South Africa during white apartheid rule, when black laborers were not provided adequate protective equipment or health care. Tens of thousands of black miners from South Africa and neighboring countries claim to have contracted silicosis and have filed several lawsuits against western mining firms operating in South Africa during those years, including AngloGold Ashanti, Gold Fields, and Harmony. Previously, South African law limited workers’ ability to sue their employers for injury or death resulting from incidents in the workplace. However, in March 2011, after a series of appeals, the Constitutional Court of South Africa ruled in favor of an original plaintiff’s right to make his claims against the company. Unfortunately, that plaintiff, Thembekile Mankayi, died of lung disease a week prior to the decision. In what many consider a breakthrough, a related case, initiated by 18 plaintiffs against AngloGold Ashanti, will have an arbitration hearing in September 2013, to be presided over by a panel of South African justices. If this case is decided in the plaintiffs’ favor, it should open the door for the tens of thousands of suffering miners and surviving families to seek recourse against negligent employers. Denim Sandblasting in Turkey - After a doctor discovered several hundred denim factory workers suffering from silicosis, Turkey banned denim sandblasting in 2009. Many of these workers do not have health insurance; many were also working illegally and, thus, have no access to legal recourse. So far, only workers who could provide proof of legal employment have been provided with disability funds. Despite sandblasted denim bans by H&M, Levi’s, and Target, production continues and has moved to less regulated countries, including Bangladesh, China, and Egypt. Jewelry Factories in China - In 2010, a Chinese court awarded damages to six jewelry factory workers who contracted silicosis in their workplace. The court victory also provides precedence for other factory workers seeking damages against their employers in compensation for injury or illness resulting from violation of Chinese labor law occupational health and safety clauses. Stone Quarries in Egypt - Silicosis has not been widely discussed related to Egypt’s numerous quarry operations (yet… post-Mubarak Egypt is working through other, more immediate, labor issues, such as wages and health insurance), however a quick scan through these pictures gives an idea as to the volume and pervasiveness of the dust produced. The workers, many of them children, are not wearing any respiratory protective equipment so they are at high risk due to prolonged exposure. Also, the dust on their clothing may be transported back to their homes and neighborhoods for others to breathe. Of course, these quarry-related issues also exist in countries other than Egypt. As you might imagine, limiting (let alone preventing) exposure to a dust that is often not visible presents certain challenges. WHO recommends various practices be implemented in workplaces, including making changes to production processes to reduce dust creation, installing improved ventilation systems to pull dust away from workers, providing respiratory and other personal protective equipment (as well as training for proper use and maintenance), and implementing environmental protections to prevent spread of dust outside the production areas. I’m in the process of reviewing various non-governmental organization (NGO) and corporate Corporate Social Responsibility (CSR, or equivalent) reports to determine the extent of silicosis disclosures. So far, response appears to be limited to discussions about silicosis prevention (Fairmount Minerals) and acknowledgement of silicosis as a significant workforce health issue (AngloGold Ashanti Limited). As I find more information and report disclosures, I will update this post accordingly. Of course, silicosis is just one of many workplace-related hazards that can be limited or avoided using stronger targeted regulations and proactive CSR initiatives to protect workers around the world. When companies say their international operations are contributing to a better life in foreign countries, I believe it is important to consider whether they are taking a proactive approach to these issues. If they haven’t evaluated the need for personal protective equipment or other safety measures, and if they haven’t included some form of health-care and retirement benefits, these companies are likely generating limited short-term benefits in exchange for long-term damage. I'm Going to a Conference! I am a PhD student researching corporate social responsibility and ethical global strategic development (particularly as related to the UN Guiding Principles on Business and Human Rights). This blog is about things that interest me in the news, in the world. All opinions expressed within this blog are my own, obviously.